Asparagus (Asparagus officinalis L.): growing, planting, caring. Do you like asparagus? Yes, it's delicious, but there's still some time before your first harvest. In the meantime, learn how to make mayonnaise! 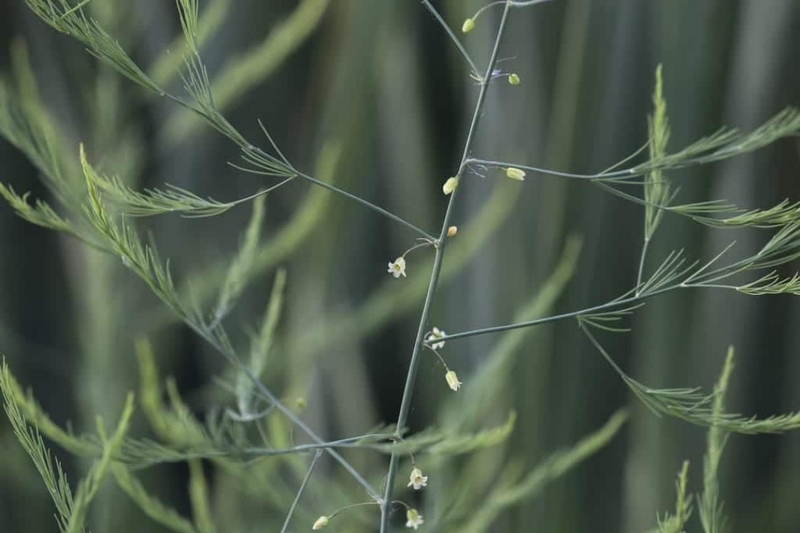 Scientific name : Asparagus officinalis L.
Asparagus is the root vegetable that requires the most patience, four years between sowing and first harvest, or only one year if you plant claws already developed for 3 years in the trade. The planting and maintenance of the mounds are sportive, warm up well. Asparagus officinalis is a tuberous perennial with stems that initially have scales-like leaves, which later form fine, light foliage. The flowers are yellowish-white, and they give red spherical fruits. Our advice is to buy roots already developed, to harvest the following year. Asparagus is planted in rather sandy soil, in any case well drained, fresh and moderately rich to very rich. Plant them in rows spaced 1.5m apart every 70cm in trenches 30cm deep and wide. Loosen the bottom of the trenches, and form circular mounds every 70 cm on which you will place the roots delicately, flat. Cover with 6 cm of soil mixed with compost and other fertilizer. Keep the rest of the soil between the trenches, as you will use it next year to form mounds over your asparagus. Put small stakes to indicate the location of the plants. In March, after a year of cultivation, your asparagus will have to be covered with an earth mound, to produce the longest possible spears for the harvest. Use the land you left between the trenches at the plantation to form mounds over the roots. Raise the mounds up to 50 cm, even if you have to bring some compost to complete. Repeat the operation each year. Mulch in March-April between the rows. After 3 years of cultivation, sow a Fabaceae between the rows instead of mulching, to enrich the soil. Water at least once a week the first month, and in case of drought during the harvest period. In March, watch your chicory every day to immediately spot the new stems, or spears, that are pointing off the ground. The first harvest, take only two chicory per foot. The following years, you can harvest all the shoots, until their diameter is less than one cm. To harvest, it is advisable to use a special tool, which allows you to slice clean the asparagus in open soil. Repot every year, to adapt the container if necessary, and especially to change the substrate. Renew it as much as possible, bringing potting soil and sand for a good drainage. At the end of the summer, remove the dry stems. Do not use badly decomposed materials to mulch the mounds, it would favor the purple rhizoctonia.